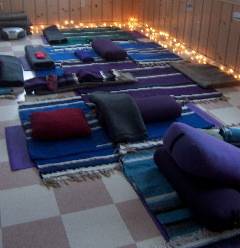 Restorative Yoga is a specific technique using bolsters, blankets, and props to support the body, which is in a completely relaxed, passive state. The body is then gently stretched by surrendering into the supported posture. Restorative yoga is great for releasing tension, rejuvenating your system, and giving yourself a mini-vacation! No yoga experience is necessary. If you have any major physical limitations and would like to attend, please call or email me so I can accommodate your needs. Space is limited and pre-registration is required. located diagonally across from the Blue Hill Co-op and to the left of Blue Hill Laundry.